Hyundai has been playing around with the concept of a mid-engine, rear-wheel drive Veloster-based hatchback since at least 2014, but it seemingly fell to the wayside. But the head of Hyundai’s new N performance division hasn’t forgotten, and the concept isn’t dead just yet. 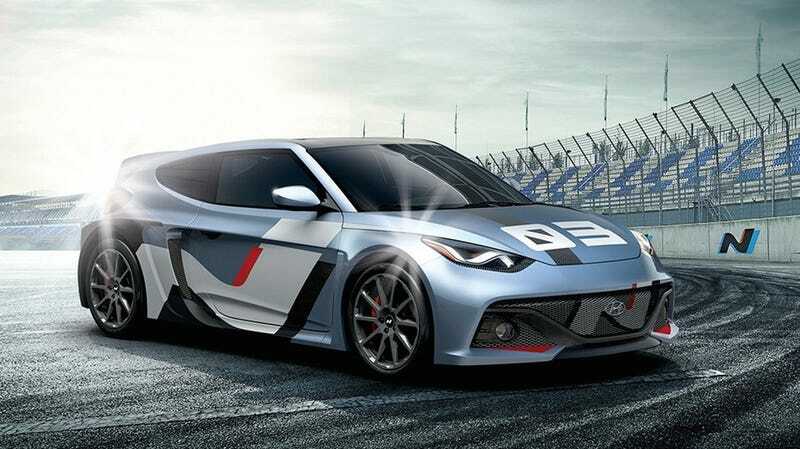 Albert Biermann, formerly the lead engineer of BMW’s M division, is the head of Hyundai’s new N performance division, and recently told Top Gear that Hyundai plans to slowly work it’s way towards all-new performance cars, possibly including the so-called Racing Midship hatchback. Biermann also mentioned N performance could also apply to EVs in the future, and the division also works with Hyundai’s sibling brands Kia and Genesis, though those wouldn’t be badged as N.
But it makes sense for Hyundai to slowly wade into the performance car maket. It’s timed perfectly, in the U.S. at least, to take up the mantle that Ford has seemingly abandoned by ditching most of its compact cars in the States. Biermann’s awareness is refreshing, and he told Top Gear he has much more freedom with Hyundai’s N than he ever did with BMW, so here’s hoping he actually commits to making Hyundais a little more engaging and exciting. It’s just still a little silly that they were so transparent in their targeting by coming up with a performance division just one letter away from BMW’s.